The new 2018 Moustache Samedi 28.3 is a beautiful in design touring electric bike, suitable for both men and women of all ages, and all riding styles. Take one look at this bike and you’ll notice some very exciting new features over it’s predecessor. Instantly recognisable is the battery’s semi-integration, hidden within Moustache’s very clever frame design. This bike looks amazing! This year sees the addition of a suspended seat-post for ultra comfort. In addition, there’s also wider tyres for better traction and comfort, and an ORTLIEB pannier-ready rear rack. This wonderful touring e-bike that was always great, just got hugely better! As we all know, Samedi is French for Saturday. This ebike is for the weekends; country lanes, city streets, or anything that takes your fancy! Powered by Bosch’s strong Performance motor means this little gem will climb even the steepest of hills. Coupled with a large 500Wh battery enables long range and lazy, comfortable days out. Fully appointed, this lovely e-bike comes in both a small 39cm frame for petite riders and a 45cm and 51cm for those a little taller. The Samedi 28.3 comes complete with bright, AXA front and rear lights, innovative tubular mudguards, and a strong rear rack to carry life’s necessities. It’s easy to handle and a real joy to ride. The 28″ puncture resistant tyres mean efficient riding on all types of terrain. A simple yet effective Shimano Deore 10-speed derailleur makes climbs effortless. Gear changing is easy via rapid-fire shifters. Braking on the Moustache Samedi 28.3 is immediate and effective thanks to a set of Shimano M315 hydraulic disc brakes. 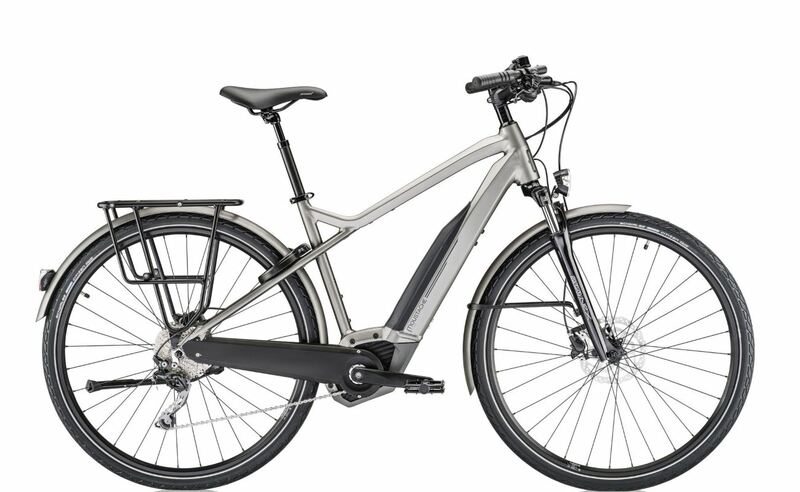 This e-bike is notable for its simplicity, comfort, safety and ease of use. The Moustache Samedi 28.3 is a simple, smooth and versatile e-bike that will get you up the steepest of climbs with ease.